ABOUT US - Behavioral HELP for Dogs! Produced seven (7) Cable Television Shows Called “Behavioral HELP for Dogs!”. This series highlights the different techniques and topics of our behavioral rehabilitation work with dogs as well as adopting secondhand dogs, purchasing and growing up a new puppy. Original Founder and Owner of Walks & Wags Pet Service LLC. At that time the company offered Dog/Puppy Behavioral Training, Finding the right dog for you, Pet Sitting, Dog Walking, Horse Care and Pet Taxi Service. www.walksandwags.com is now owned by Candiss' assistant, Michelle DelCastillo and exclusively focuses on Dog Walking and Pet Sitting. What sets me apart from the average dog trainer? I tailor each session specifically to your needs. There are no cookie cutter appointments with me as your trainer/rehabilitator. It's all about you and the success you achieve in relating to your dog correctly. Years of research have given me the knowledge and ability to get to the very roots of an issue and deal with it from the inside out, giving you the tools and ability to carry on successfully after I leave. I will leave you well equipped when our sessions are completed. Allowing you phone or email access to me for the lifetime of your dog also leaves you with peace of mind that you are not on your own. My ability to convey the procedures of becoming comfortable with your leadership role in relationship to your dogs is the key to dissipating the problems you are facing. Since I understand the innate makeup of a dog, in other words, what makes your dog tick, I am a stickler about passing this information along to you as well. Without this key component, no amount of dog training is going to stand the test of time. My philosophy in dog training and behavioral rehabilitation closely parallel those of Cesar Millan, the Dog Whisperer. Inspired and encouraged by his approach, I noticed the remarkable parallel between dog training and child training. The techniques vary, but the philosophy is the same. Although child rehabilitation is not a provided service, as clients begin to grasp and adhere to the concepts used in my sessions for their dogs, they find themselves more confident in their parenting skills as well. I have seen it make for a more stable family situation all the way around. The Behavioral HELP for Dogs! sessions are, in some cases, my client’s last resort before putting their dog down or relinquishing it to a shelter. In every case like this, I have been successful in educating owners and eradicating the unwanted behaviors, allowing the dog to stay with its owners. In an effort to help people with their new puppies and avert problematic behaviors from arising, the ‘Start 'Em Out Right~Puppies!’ Sessions was created. In order to assist people in finding the right dog for them, the Matchmakers Service was born. As a Certified Dog Trainer, it was a very special experience for me to produce seven cable television programs called "Behavioral HELP for Dogs". Through the Cable Commission in Prescott, I had the opportunity to write, direct, and host these shows with the assistance of my assistant, Michelle. We were able to share our training and expertise with an even larger audience than in our one-on-one sessions and group seminars. Click here to view Cable Shows! Attended That's My Dog! Academy. Linn Boyke, one of Cesar Millan's personal apprentices, was a primary instructor. From 2007 - 2011 Candiss and her family operated D'animal House when the owners were away. D'Animal House was an intermediary handler of animals (usually adult dogs & pups) that were in transport from one location to another worldwide on Northwest Airlines just before it became Delta. Michelle has been with the business since our opening in 2007 in both administration and dog handling. 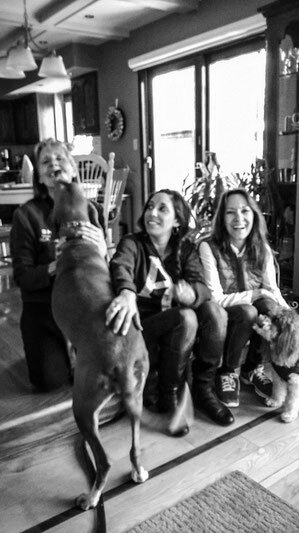 She occasionally accompanies Candiss to a client’s home, for a "Behavioral HELP for Dogs!" Session and also assists with the Seminars that Candiss conducts. Michelle's main duties lie with sister company, Walks & Wags Pet Service, a company that Candiss founded in 2007. 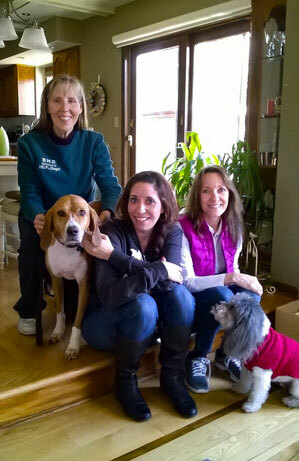 Michelle is now the owner of Walks & Wags, which handles, Professional Dog Walking and Pet Sitting. For more information, please contact Candiss at: info@behavioralhelpfordogs.com or 715.220.5045. All training is performed at the client's home.